According to a recent press release, only one art exhibit was approved for display at the recent UN climate change talks in Doha, Qatar. Sponsored by the island nation of Tuvalu (population 10,000), it was created by Taiwanese artist Vincent J.F. Huang. Featuring a suicidal political-protester penguin, its purpose was to draw attention to the fact that wild animals are affected by environmental changes. Since every child learns this at her mother’s knee, there’s nothing in the least daring about such a message. Which is why Huang – an official member of the Tuvalu delegation to the climate talks – apparently felt the need to go further. Profound, huh? I mean, really. If your kid produced this kind of “art” the school would be calling in psychological counsellors. But there’s a more serious angle to this story. The art exhibit press release claims that, in 2009, the Intergovernmental Panel on Climate Change (IPCC) predicted that Tuvalu would be “the first country to be submerged” due to rising sea levels. That claim is repeated in the news article on the conference website. But when I asked the distributors of the press release to direct me to “the IPCC document that makes this prediction” they were unable to do so. Here below are a few links to Tuvalu’s data. 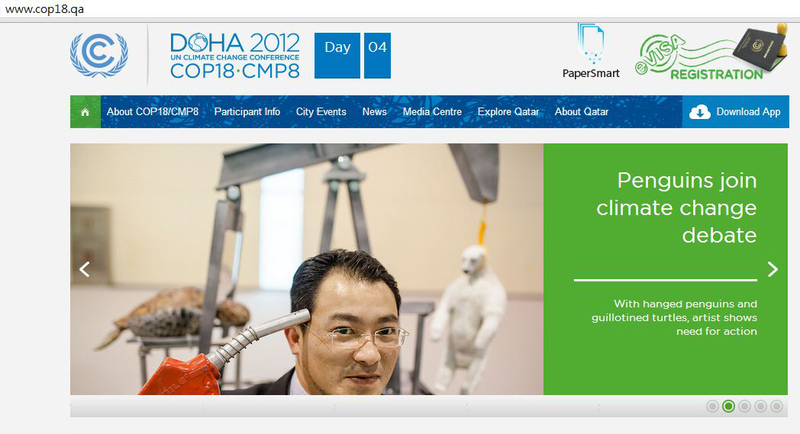 Vincent Huang was appointed as a Tuvalu delegate for COP18, I have included a few links to related coverage as well. Let me know if you would like to interview him or if you’d like any more info on his involvement with Tuvalu. a 2002 document about sea level change written by John R. Hunter. According to his homepage, this is an “unpublished technical report” rather than a peer-reviewed academic paper (see here and here). In other words, all of these sources pre-date the supposed 2009 IPCC announcement. Only #2 and #4 even mention the IPCC. None comes close to supporting the claim contained in the press release. Perplexed, I’ve conducted some searches of my own on the IPCC’s website. My conclusion? If the IPCC has said Tuvalu will be the first to disappear due to climate change I can find no trace of it. This claim appears to be a total fabrication. A thoughtful piece about the climate change debate and Tuvalu appears on the Klimazwiebel blog here. The full text of the press release, dated Dec. 3, 2012, appears here – along with additional photos. On the final day of the Doha conference, a second art-exhibit-related press release was issued. See it here (backup link). This entry was posted on December 13, 2012 by Donna Laframboise in IPCC and tagged Intergovernmental Panel on Climate Change, IPCC, sea levels, Tuvalu, Vincent J.F. Hang.